October and Ladakh are not two things that go together. Winter starts to set in; it starts snowing; temperature creeps into negative territory and add to that the problems of high altitude. But when the plan was hatched; I just couldn’t resist saying Yes. Ladakh has been a dream trip of mine; and I didn’t want to wait for another year for a chance. If you are in a hurry read the headings and skip to the tldr; below. The popular approach to Leh is via the Manali-Rohtang-Leh highway, but since that journey would take 2 days and we had just 6 days in total at our disposal, we decided to book a flight from Delhi to Leh. Apart from having to wake up at 3:00 AM to catch the flight at 5:00 AM, there weren’t much difficulties considering that we were flying into highly sensitive territory. The flight was an enjoyable experience. There aren’t many views from outside an aeroplane window as spectacular as the ones you get when you fly over the highest mountain range in the world – the snow covered Himalayas. The Kushok Bakula Rimpochee Airport in Leh is a small one with basic but functional facilities. It is also one of the world’s highest civilian airports at an altitude of 3,256 metres above mean sea level. We took a pre-paid taxi into Leh city (5 kms away) and checked in to a guesthouse close to the main bazaar. The Ti-Sei is a family run guesthouse with modest facilities but with a cheap price tag (Rs 250 per head per night). The only problem I could find is the lack of proper quilts for such cold weather. My fellow travellers disagree though; so I would be hesitant to recommend the place to you especially during winter. Since we jumped from an altitude of 200m to 3250m in just an hour, we ran the risk of catching altitude sickness and it was recommended that we take complete rest for 24 hours to acclimatize to the thin oxygen content in the air. So that’s what we did. We spend the entire first day in the guesthouse playing cards. Only Sanjay and I knew how to play; so the added pleasure in teaching Sony, Lishoy and Gautham the joys of ’28’. Should be useful in the future too. It was still risky to attempt higher altitudes in the beginning of the trip, so the recommendation was to travel around the vicinity of Leh. We first went to an old Buddhist monastery at Hemis some 40 km away from Leh. 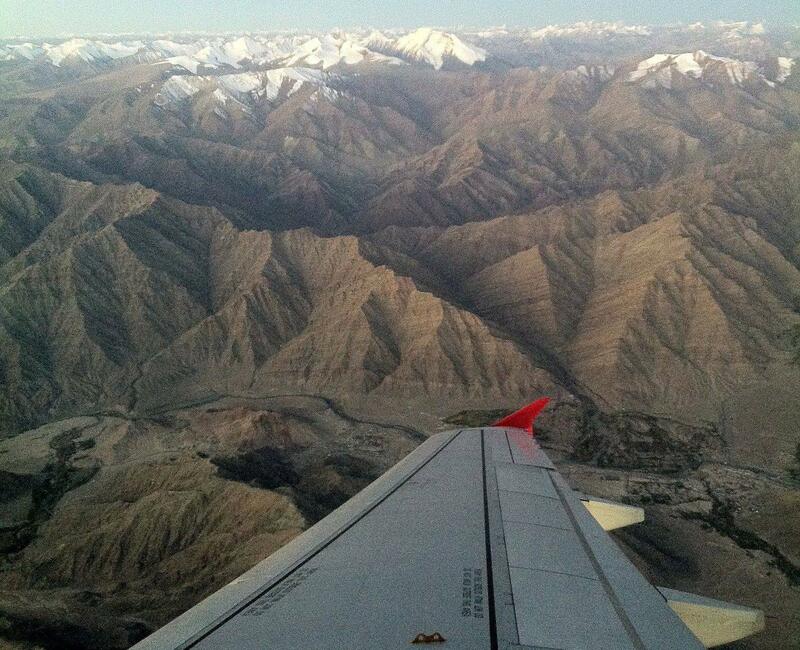 We were treated to our first views of the strangely beautiful landscape of Ladakh. The monastery was more or less uninteresting to me (having been to countless ones on my last trip to Sikkim) but there is a small museum in the compound which has a lot of artifacts and photographs chronicling early life in Ladakh. Next stop was the school featured as Rancho’s school in ‘3 Idiots’. This one was rebuilt after the Leh floods of 2010; with the help of contributions from the star of the film – Aamir Khan. Nothing much to do there except click a few photos. Next was the Thiksey monastery; one of the most photogenic of all the ones in Ladakh. More clicks followed and we had lunch at the monastery canteen. Food was good; but order time was way above our irritation level threshold. We then moved on to Shey palace, the erstwhile summer capital of Ladakh. It’s constructed on a small hill on the side of the highway. Most of the palace is in ruins and what’s left of it is a protected monument under the Archaeological Survey of India. The vista from the top is once again spectacular. Following that we went up the Shanti Stupa, a monument close to Leh town, constructed by the Japanese. Another top (double entendre, yea!) spot for landscape gazing. We then walked down the 500 odd steps back to where our car was stopped. And with that we retired back to our guesthouse. The next day we decided to scale higher and go to the famous Pangong Tso (Tso means lake). The route passes through some very treacherous terrain and our first stop was Chang-La; supposedly the third highest motorable pass in the world. The air was super thin over here and we were advised not to stay for more than 20 minutes. The place has a small cafeteria and an Indian Army outpost (which serves free tea). 20 minutes itself felt a bit too much due to the chilly winds and we packed up from there quite quickly. The road descended down the mountains into a valley and they were in impeccable condition. It’s almost magical to imagine how those roads even came to existence in such inhospitable terrain. Kudos to BRO and their army of engineers and workers who made this happen. The deserted barren landscape up until the lake is impossible to describe in words. It was something unlike anything I have seen before. The streams that trickle along the silent valleys; the deserted roads that alternate between winding up and down mountains and then proceeding straight as an arrow on the plains; the huge tracts of white sand as fine as talc; the occasional yak grazing on the little patches of grass around; alien flowers and vividly colored mosses trying its best to thrive amongst the thawing ice – the sight is just surreal. 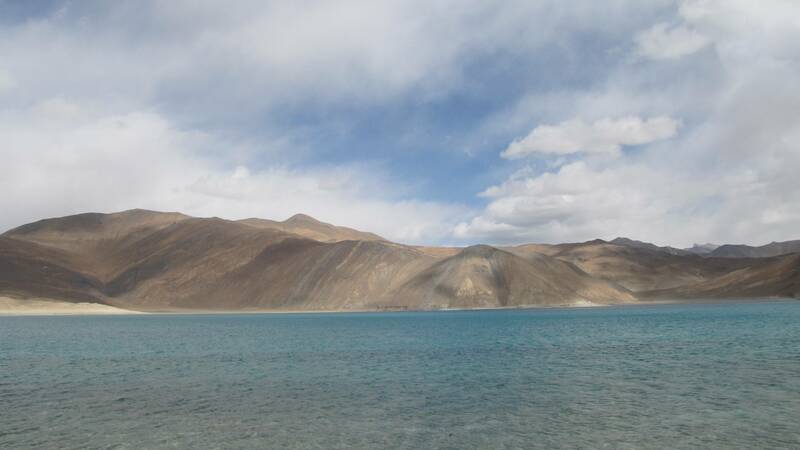 Pangong Tso is a huge lake spanning 700 km2. Only about 40% of the lake is in India; you almost feel tempted to swim across to China. The lake is mostly unpolluted (our driver Dorjey says that there’s a Rs 1000 fine for even a tiny bit of plastic left on the shores) and provides an ideal hunting ground for us camera addicts. The area is uninhabited except for a few small villages further up the tourist point. There are a few shops that provide basic lunch (read Maggi noodles). I hear that during peak season there are a few places where you can stay and enjoy the morning freshness by the lake. Being just a few kilometres from the Chinese border there is an inconspicuous but strong army presence in the area – which has a medical aid post and a helipad; though I doubt if civilians have access to that. We returned back to Leh the same day; it was a rather tiring trip with 10 hours spent in the car; but totally worth it! 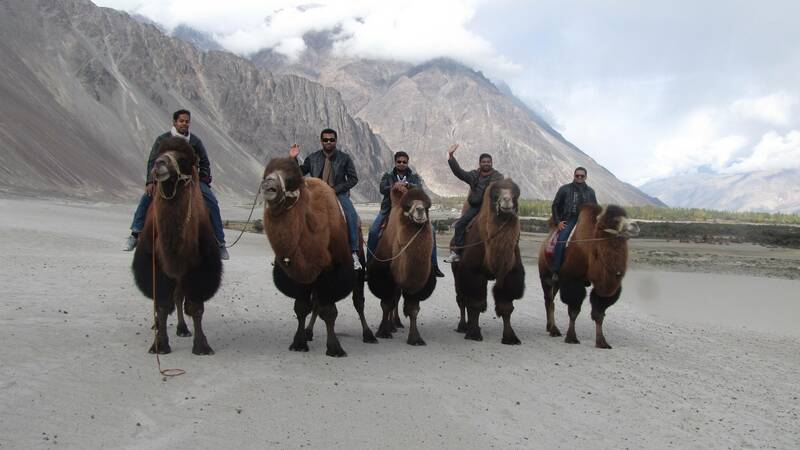 Another big hit amongst Leh backpackers, the Nubra valley is just across the mountains from Leh. But since those mountains are the mighty Himalayas; the route is through one of the toughest roads in the world. First stop was off course; the highest motorable road (contentious) in the world – the Khardung-La. The Khardung pass is located at an altitude of 5359 metres above sea level. And is is the theme with all high altitude outposts; there’s a small military camp here and also a cafeteria (which claims to be the highest in the world). It was quite chilly outside with the local army guys estimating the temperature to be -5 degrees. We had some hot noodles and tea from the cafe there and rushed back down. The roads aren’t very good at this point – but the fact that there’s a road up here in itself amazing – so no complaints. Down into the valley; we stopped at the first hamlet on the way – the village of Khardung – for our lunch. There’s just one small restaurant open there – but the food was amazing. We resumed our journey towards the town of Disket. The scenery en-route was even better than the Pangong trip. We stopped near the town of Khalsar; along the side of the river Shyok. Being winter the river wasn’t thundering down; and we could easily access the river bed – with towering mountains flanking us on both sides. Just then; like a scene in a Hollywood thriller; an army helicopter raised itself from far away in the valley and flew past us. What a spectacle that was! We reached Disket early in the evening; but unfortunately couldn’t find a decent place to stay there (all open hotels were booked). We decided to try our luck in Hundar a further 10 kms away. We checked into the Snow Leopard; which was a beautiful little guesthouse overlooking snow capped mountains. We spent the night there; listening to stories from our driver who was a very colourful character; over a light round of drinks. We checked out early in the morning itself and went straight to the sand dunes of Hundar. It’s a real strange concoction. Sand dunes are the last things you would associate with the Himalayas – but there they were; sand dunes sprawling acres into the valley. You could walk up to the sand dunes by foot or approach them on unique double humped Bactrian camels. We did both. Riding on a camel is a curious experience; and a bit scary especially when you feel like the camels are starting to run! We spent a few hours ‘chilling’ up on the sand dunes and started our return journey back to Leh by around noon. It had snowed the night before on the mountains; and the roads weren’t in their best conditions – complicated by the fact that we didn’t have snow chains. A few kilometers before the Khardung La pass; we had to stop to allow a huge contingent of army trucks (possibly transporting supplies to Siachen basecamp which is just 100 kms away). While we were stopped; Nanda, Gautham and I decided to walk up and see if we could reach Khardung La on foot. I stopped short by about a few hundred meters away (not knowing that at the time) and waited for the car to reach me. Going up a few more metres just as the army camps became visible there was a second block. But this time the block wasn’t for the Army – unbelievably, I got a glimpse of a Formula 1 car in the background! 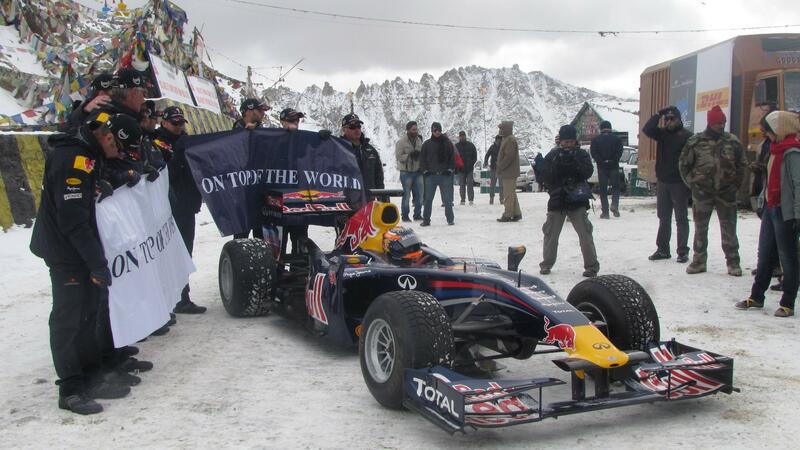 The Red Bull Racing team had decided to do a promotional drive on the highest motorable pass in the world at that exact moment. Talk about serendipity! We took a few photos up there with the cars and had to leave fast (the temperature was near -10 degs and there wasn’t much parking available). We had food at another small army canteen down in South Pullu and reached back Leh before night fall. Sunday was the last day of our trip and being quite tired from all the travelling we decided not to go far that day. By afternoon we left on National Highway 1 for Zanskar Sangam – the confluence of the Zanskar and the Indus rivers. Nothing much to say about this place – the beautiful scenery is default for any place in Ladakh. 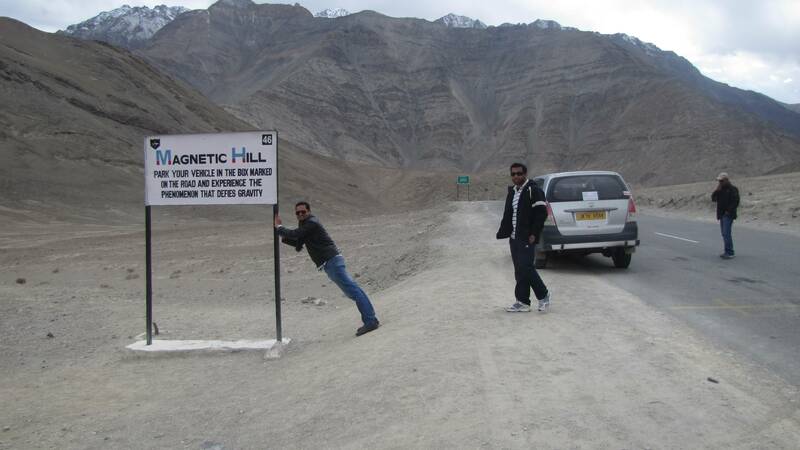 On the way though; there is a small stretch of road aptly titled ‘Magnetic Hill’. Due to an optical illusion there, it feels as if a vehicle goes uphill when left to itself without any engine power. It fools the best of us for sure! Tough to make your brain believe that it’s an illusion and not some strange magnetic forces at work. On the way back, we also stopped at the ‘Hall of Fame’; a small army museum with exhibits showing life of the army at high altitudes. It’s just amazing how people cope up with the extreme harsh climate of the whole place. With that we concluded all our tryst with Ladakh. Next day morning we boarded from Leh airport; back to Delhi. The security measures at the airport was the tightest I have ever experienced (understandably owing to its location in J&K state) – my bag was checked thrice; and I had to pass atleast 5 levels of security checks before boarding the plane. Treated with another grand view up above the Himalayas; we finally landed back in Delhi. The sun is quite harsh in Ladakh. Do carry sunscreen creams (> SPF 50) and good sunglasses with UV protection. Don’t get burned. A lot of places (Pangong, Nubra etc) require Inner Line Permits (ILP) for Indian citizens and Protected Area Permits (PAP) for non-Indians. This can be arranged by most travel agencies and would require a government issued ID card (driving license/PAN card/voter’s ID/passport). Biking is a good option rather than car if you are interested in riding and you are a skilled driver. There are plenty of places that rent out bikes in Leh. But don’t do this in October though; it gets quite chilly. No one rents out cars for self-drive though. If travelling by flight; acclimatization against altitude sickness is a must. Drink lots of water and rest for atleast 24 hours before attempting higher altitudes. 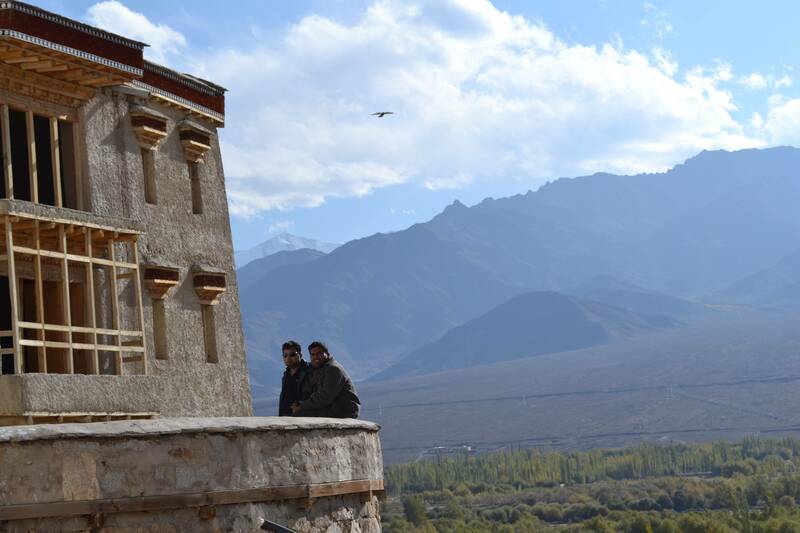 October is not the greatest month to visit Ladakh; but we were quite lucky to be blessed with good weather. Being off season; things were quite cheap. A lot of shops and restaurants close by end of September and the number of tourists are low. That however also adds a different dimension to Leh; it’s like you have the mountains to yourselves. The peak season is July-August. Roaming is available (in entire J&K state) only for post-paid customers from a few states in North India; so if your SIM is not from these states your mobile will not work. There are telephone booths and internet cafes in Leh though. I found a net booth; even in the remote Diskit town. Only Aircel, Airtel and BSNL has connectivity in Leh as far as I know. During off season try to stay close to the main market in Leh; as most other shops would be closed. There are no autorikshaws in Leh. There are 6 ATM counters in Leh market – 2 of J&K Bank, 2 of SBI and one each of Punjab National Bank and HDFC. I didn’t see even one shop that accepted debit and credit cards. If you are travelling out of Leh, make sure you have money with you. No ATMs outside Leh. Good places to stay – Santhi Guesthouse (near Santhi Stupa), Hotel YakTail (Fort Road) and Hotel Tso-kar (Fort Road). We spent the last day in Hotel Tso-kar and it was pretty clean with room service and cheap rates (Don’t know about season rates though).